Find the right Kawasaki motorcycle Saddlebag here at Viking Bags. 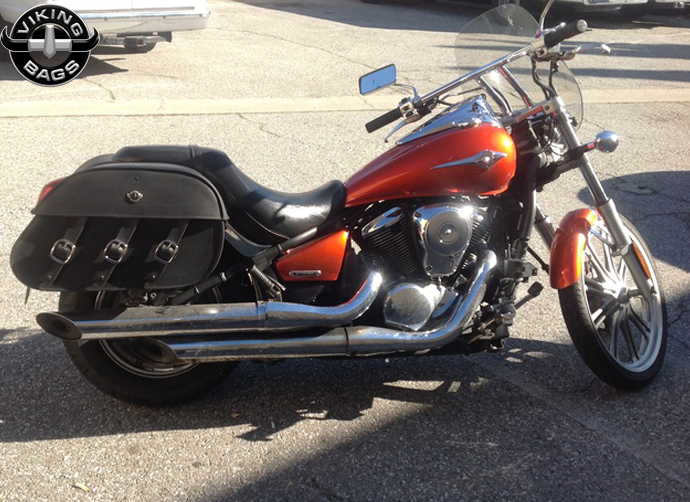 There’s many different saddlebags available for the many different Kawasaki motorcycles. 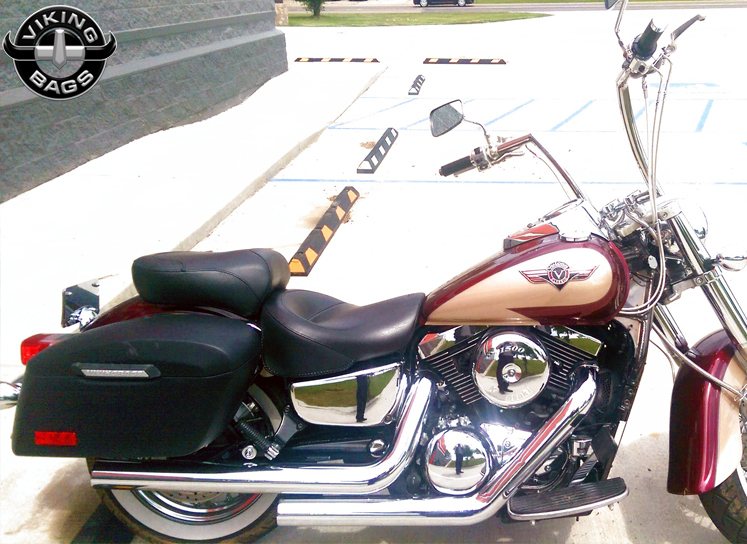 We offer the best industry standard of free mounting hardware to help ease the installation and mounting of our saddlebags. Why waste precious time on installation when you could be out riding and enjoying the weather. Don’t worry about storage problems anymore on your Kawasaki motorcycle. 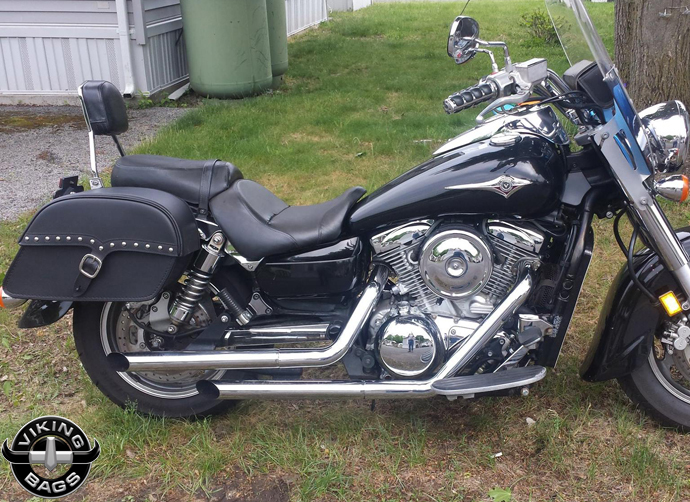 Add in our motorcycle quick disconnect brackets and conveniently remove the bags when they’re not in use. Get one of our premium Kawasaki saddlebags now. Viking manufactures some of the world's most attractive saddlebags for motorcycle applications, and the Kawasaki saddlebags are no different. Featuring a wide variety of styles, construction materials, shapes and designs, we are proud to offer some of the most resilient saddlebags on the market. The saddlebags will change the way you experience riding from now on, and we put a lot of confidence in that understanding. If you have any questions or concerns for our products, feel free to give us a call and we'll help you out. 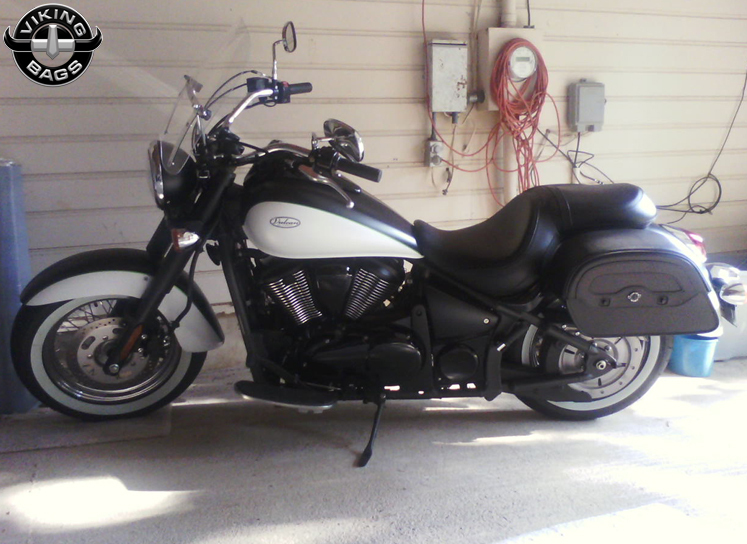 Vikingbags.com offers the best Kawasaki Saddlebags for Kawasaki Motorcycles. 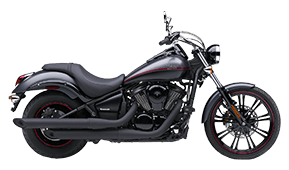 We offer Kawasaki bags specifically for Kawasaki Vulcan, Eliminator and Mean Streak models and a variety of looks and sizes. 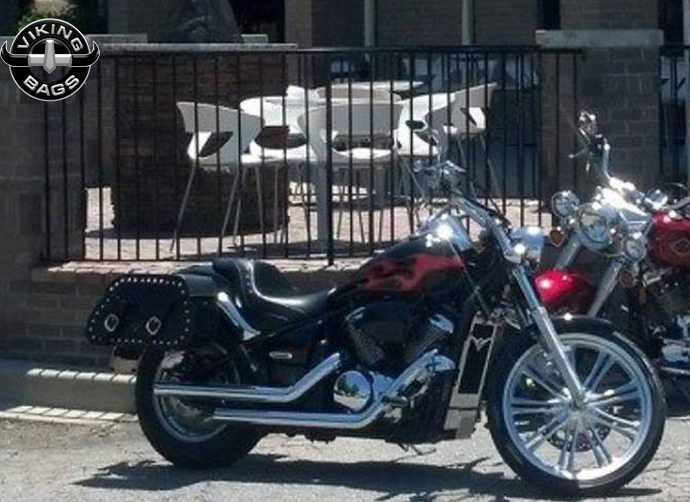 Our Kawasaki Saddlebags are durable, reliable and easy to mount. Customers who have purchase a Kawasaki Motorcycle luggage bag will receive a free set of mounting hardware. This online guide exists to teach you about the many aspects that make Viking Bags such a great luggage product to own. 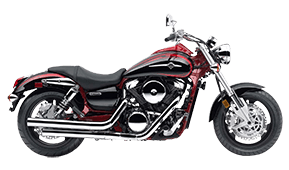 From the Kawasaki cruiser bikes to the stylish sport bikes that riders so love, you can find your specific model's saddlebag here in our inventory. Some of the Viking Kawasaki Saddlebags we feature in our online inventory are made of high quality synthetic leather, resisting weather yet providing riders with an elegant outer appearance. Each Kawasaki saddlebag has chrome buckles on a quick release system, giving riders the ability to easily access the interior while giving users an attractively durable set of features. For riders who want a bit of extra durability in their motorcycle luggage, we proudly offer a full lineup of Viking hard saddlebags. These Kawasaki saddlebags are built with the same ingenuity and thoughtfulness as the leather saddlebags, but they provide the rider's interior contents with extra strength and precision resilience in the face of danger. From extreme weather conditions to harsh road elements, these Viking saddlebags are built to withstand everything the rider can handle. We understand that pushing the limits of the body and motorcycle's abilities are what make riding so much fun, therefore we're offering you saddlebags that won't give into the daily ride. Kawasaki bags are usually kept attached under bike seats and are compatible with all brands and bike models. These pouch bags look handy and are meant for holding items like light weight tool kits or personal belongings. Earlier, these bags were mostly used for mountain bikes, racing bikes as well as for touring bikes. With changing times bike riding styles too have changed leading to their wide usage for regular everyday rider needs. Mostly made of leather, Kawasaki saddle bags are also found in faux leather variety. As a great combination of modern style and classic utility of carrying baggage, Kawasaki bags are acclaimed as smart solutions for utility biking storage. As one of the biggest global consumer brands, Kawasaki knows varied consumer tastes which are the reason behind the wide options of size and shapes of saddlebags for Kawasaki. These are typically available in white, black and brown colors and for those with more discerning tastes VikingBags offers the option for custom orders with a particular shade of their choice. Kawasaki bags are extra safe in terms of security: built-in lock system, easy manoeuvrability, and balanced grip are the features that will keep your luggage safe and perfectly in shape for years to come. Kawasaki bags are extremely easy to install. You only have to purchase good quality brackets and have to punch a hole at the rear side of the bag. One line of caution: double check the fixing arrangement so that the saddle bags do not lean on the rear suspension of the bike, because this could cause many problems later down the road. 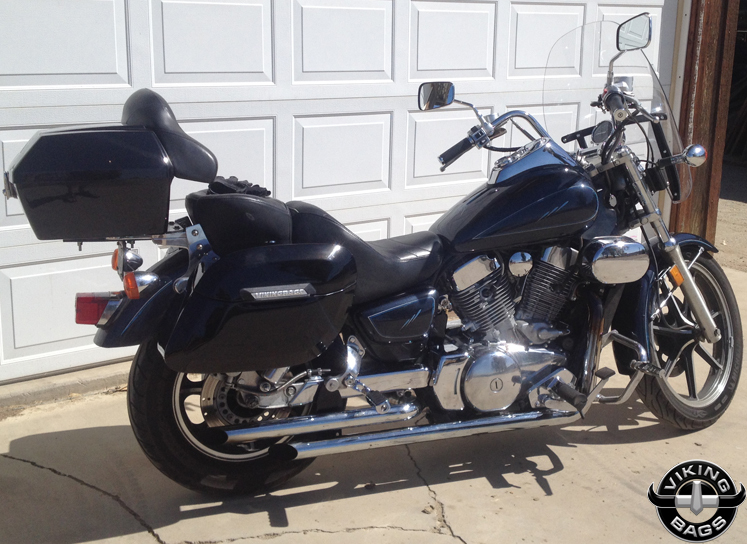 Viking Kawasaki motorcycle saddlebags are easy to mount and come with a built-in hard body to prevent sagging. Because each of these bags comes with a free mounting kit – a $100 value – and easy-to-read instructions, all riders can quickly mount their saddlebags any way they choose. We know not every rider is mechanically inclined or experienced, so we feature Viking's lineup for the common, everyday rider in all of us. We are confident that you'll love our selection of Kawasaki saddlebags, so we're offering a confident agreement in the form of a 30-day money back guarantee. 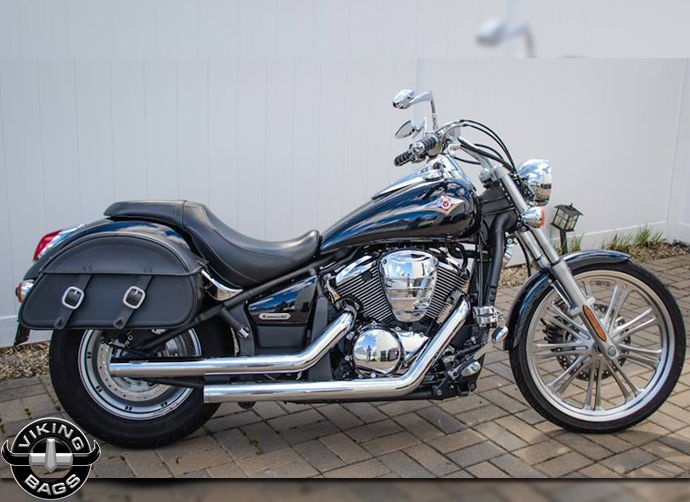 After purchasing your saddlebags from us, you may return for a full refund or exchange for another pair of saddlebags, so there should be no worry in ordering online. 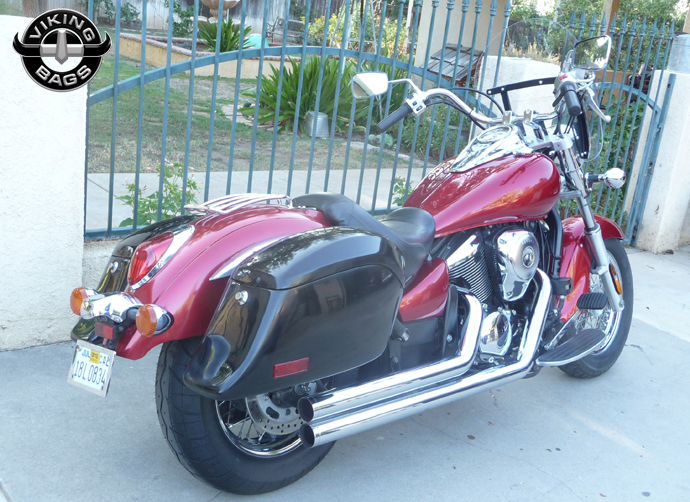 We want you to be completely satisfied with your new saddlebags, so let us know what we can do to make it right. That's our promise!